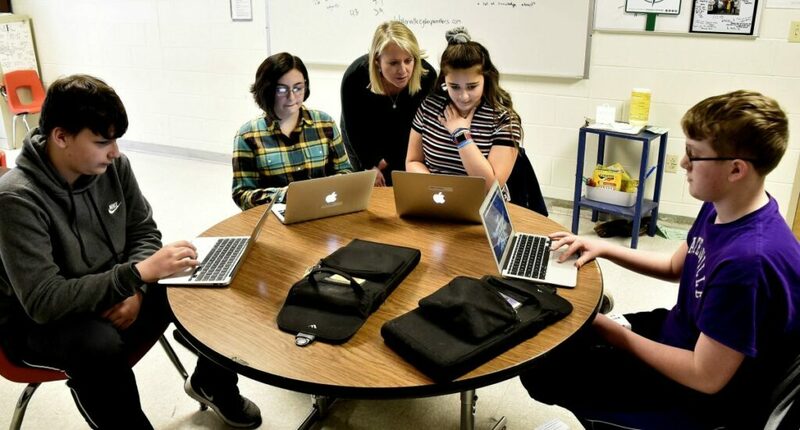 WATERVILLE — When students at Waterville Junior High School sign up for their high school courses next week, they’ll have a new option that wasn’t part of the curriculum before: computer science. 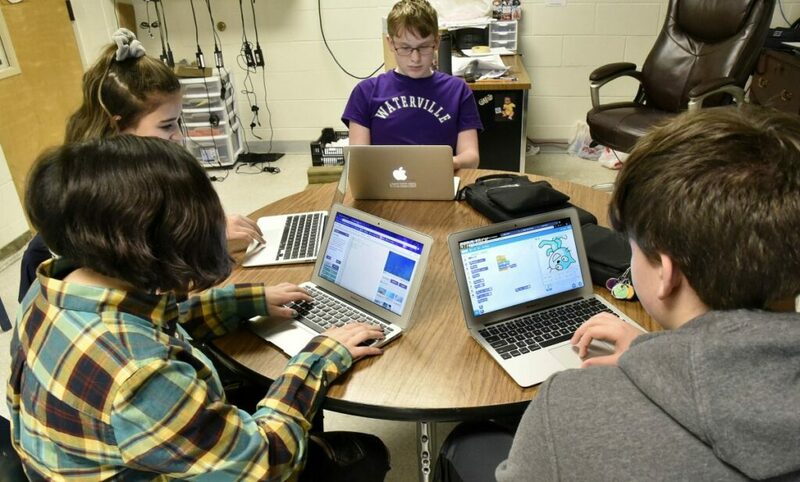 The elective class, named Cyber Panthers, will include instruction in app development, virtual reality, artificial intelligence and other 21st century fields not currently taught. Morning Sentinel photo by David Leaming Waterville Junior High School student Alexa DeWitt concentrates on an assignment through her computer Thursday. 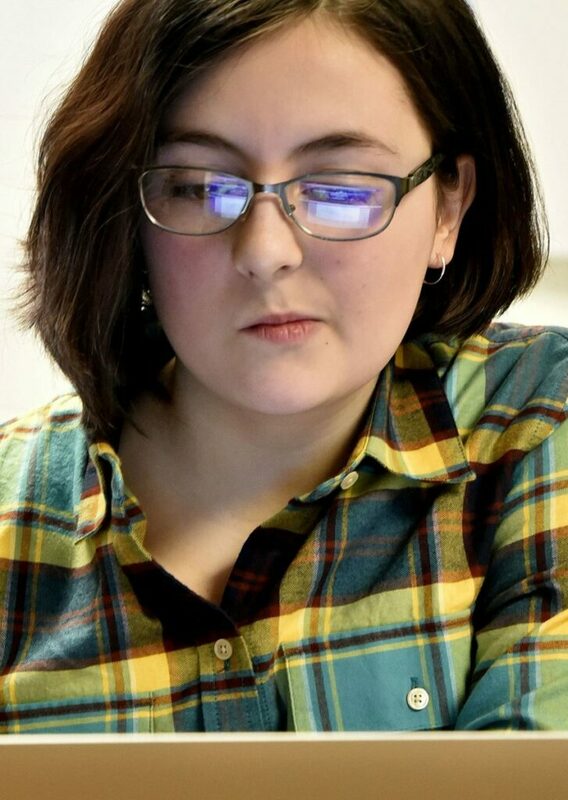 When she moves up to Waterville Senior High School, she will have the opportunity to participate in a unique computer science pilot program funded by an $881,000 grant from the Harold Alfond Foundation. Morning Sentinel photo by David Leaming Waterville Junior High School students, clockwise from lower left, Alexa DeWitt, Leilani Gomez, Zachary London and Dylan Mitchell, work on assignments with computers Thursday. When they move up to Waterville Senior High School, they will have the opportunity to participate in a unique computer science pilot program funded by an $881,000 grant from the Harold Alfond Foundation. With an $881,000 grant from the Harold Alfond Foundation, the course is being introduced for ninth-grade students at Waterville Senior High School in the fall with plans to grow the program as the students progress through high school. The Boston-based Center for Curriculum Redesign, a nonprofit dedicated to improving education, is working on developing the course, which it hopes also will serve as a template for innovative computer science programming in schools across Maine and possibly the country. She and others say the program will help meet growing demand for computer science jobs in the workforce as well as prepare students for a variety of careers in which technology is growing. According to the U.S. Department of Labor’s Bureau of Labor Statistics, computer and information technology occupations are projected to grow 13 percent nationally from 2016 to 2026, faster than the average for all occupations. The median wage for computing and information technology jobs was $84,580 in May 2017, compared to the median annual wage for all occupations of $37,690. In Maine, more than 750 net jobs are expected to be added in the computer and mathematical fields between 2016 and 2026, according to the Maine Department of Labor’s Center for Workforce Research and Information. The average hourly wage for such jobs ranges from $24.55 to $52.92. The idea for the program in Waterville came about after a conversation Waterville Public Schools Superintendent Eric Haley said he had with Greg Powell, chairman of the Harold Alfond Foundation, in which Powell mentioned that the Center for Curriculum Redesign was interested in running a pilot computer science program in Maine. The conversation also came around the same time Haley said he heard a presentation from high school Principal Brian Laramee and Director of Guidance Lisa Hallen that indicated a high percentage of high school students are not engaged in the programs available to them.